We are midway through October and I feel like we don’t have enough weekends left to do all the things we wanted to do. With so many fall festivals and Halloween events (see Shannan’s post from earlier this month) and only so many weekends, there is no way that we can do it all. That is why, I am planning 2010 Farm Fest Tour or Bust for our family this Saturday (I still haven’t clued them in). Our first stop will be Schappacher Farms – 3829 South US Route 42, Mason, Ohio. Schappacher is a great smaller scale farm. They offer free hayrides and a free corn maze on the weekends. They have farm animals on site that you can interact with – donkeys, goats, & cows. You can take a hayride to their pumpkin patch and pick your own pumpkin to purchase. There is also a cute farm store selling pumpkins, apple cider, fall decorations and some concessions. Open daily 10am-6pm. 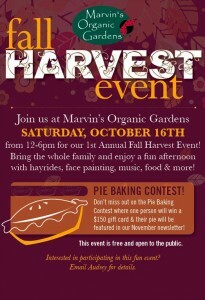 Next, we are going to the first annual fall festival at Marvin’s Organic Gardens. The people at Marvin’s are so friendly. We’ve enjoyed other family events at Marvin’s and they always do a great job plus if my kids ask me when we get to go back, then I know it’s a winner in their book. The free festival is from Noon-6pm and they will have face painting, hayrides, music, food and more. For all the Betty Crockers out there, enter their pie baking contest and you could walk away with $150 gift card and have your winning pie featured in their newsletter. Marvin’s is located North of Schappacher Farms at 2055 US Route 42, South Lebanon, Ohio. If my kids husband is still up for it, we will continue on our journey towards Lebanon. We’ll make a stop at The Black Barn – 1161 West Main St., Lebanon, Ohio. Here the girls can enjoy face painting and pumpkin decorating as well as another free hayride. I’ll have them pick out some fresh produce at their farm market too. Festival events are from 10am-4pm. Rounding out our journey, we’ll stop at Irons Fruit Farm. Offering free hayrides to their pumpkin patch on the weekends (wagon rides are from Noon-5pm and are every 15 minutes or so). You just pay by the pound for your pumpkin. They also have “u-pick” crops if you want to experience even more farm fun. There is a 12 acre corn maze to go through ($6/13 years and up, $4/5-12 years and free/4 and under). Save some room for some yummy bakery items – an apple fritter or an apple cider donuts sure sound tempting. Irons is located at 1640 Stubbs Mill Road, Lebanon, Ohio. Boone County Farmers Market – Burlington, KY – Check out Becky’s post Sunday to see the fun waiting for you in Northern KY.
We’d love to hear about any favorite farms your family enjoys. Just leave a comment below and enjoy this great time of year. Katherine, we’ll be heading there after our my girls soccer games as well. Sounds like you have a busy weekend too. I still need to get to the zoo & Parky’s – so much to do so little time. Katie – looks like you are trying to fit it all in too – lol. Thanks for the plug for Marvin’s. I haven’t been there yet but plan on taking my 4 year old on Saturday after soccer – we may add some of the other stops you mentioned too. I may decide to enter the pie contest – I have done that before in Colorado but did not win….Sunday we are off to the zoo and maybe Parky’s on Friday night….crazy busy with fall activities but it so much fun. At least Little Miss holds it together (mostly) when we skip nap! I think after today we won’t see nap again until Monday! Haha! I am also trying to figure out our plans for the next three weekends so we can hit the zoo and some sort of pumpkin patch/hayride place … plus fit in birthday parties, naps, church and a work trip for me! Oh yeah, and I’m contemplating going to Dayton for Sesame Street Live. At least we’ve already done Halloween Nights at Parky’s, which is actually open PAST 6 p.m., unlike most other family-oriented fall/Halloween stuff.